Lorong Ara Kiri - Now a Private Road? "Lorong Ara Kiri – Now a Private Road? Since when? "… This must be the most asked question these days after the Asia Park has erected and started charging people for parking on the piece of land infront of our infamous TMC (Teng Mini Market) since beginning of October 2006. Officially as reported by The Star on Oct 6 2006, Perdadanan Pengurusan Kompleks Lucky Garden (PPKLG) has claimed the road infront of PPKLG which is Lorong Ara Kiri to be theirs as of Aug 1 2006. PPKLG Chairman P.Periasundram said the parking lot which was managed by City Hall / DBKL has been returned to PPKLG and has been turned into a private car park managed by Asia Park who inturn is paying PPKLG a monthly fee for using the property. The charges for parking starts at RM1.50 for the first hour and RM1.00 for each subsequent hour. Shoppers at TMC for amounts above RM30.00 will automatically get the first hour free. As for passer bys or people who are unable to locate a place to park their cars will be allowed a 10 minutes grace / pass through period. Imagine the amount of papers and parking tickets they would have used if everyone still uses the road to pass through. Wasn’t Bangsar all about going Green these days? While this new arrangement has its pros and cons, many people are wondering why a road infront of a building is actually private instead of public especially after so many years. Without a doubt, someone obviously made a bundle from this particular arrangement. Many people now have to find parking elsewhere in the already space limited Taman Lucky (Lucky Gardens). Coffee Shop owners have voiced their unhappiness over the matter saying that traffic is not terrible and that people can no longer park there at the usual 10 or 20 cents . Each time they get in there, it costs RM1.50 minimum. Shoppers of TMC however welcome the move. Looking for a parking is now easier than ever. The road is also less jammed. 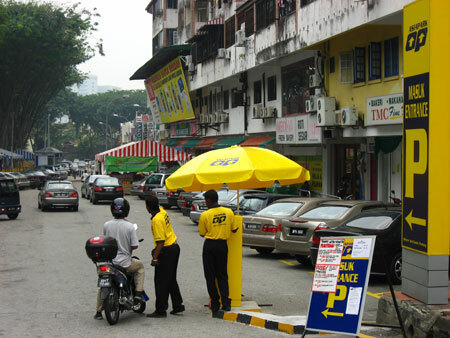 People now avoid that area and TMC shoppers who normally tend to purchase more than RM30.00 gets free parking. Those who normally purchase below RM30.00 will think twice and compile a longer shopping list before making a trip over to TMC. Either way, the roads are now clearer on Lorong Ara Kiri and parking couldn’t be easier. The real question is… is all this legal… and how did it become legal? This surely is one funny case of a public road turning private after so many years. City Hall has yet to be contacted and make a comment on the above matter. 11/20/2007 7:29:35 PM sonnykok2 This is truly a broad daylight robbery. 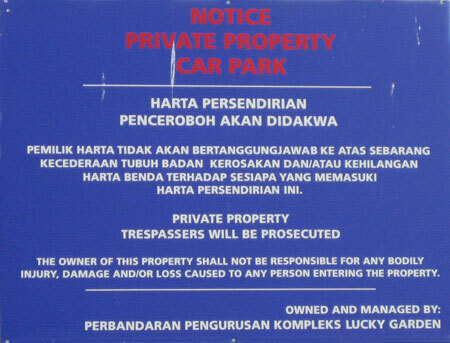 It's free parking at the moment in Telawi areas, so I can't see why this should happen in Lucky Garden? Obviously this is against the National Land Code. 10/14/2006 1:05:22 PM Blacknight It is no doubt a convenience to people who wish to make purchases in TMC... but can they actually say that the "public" road is theirs? Who actually gave the building a right to have its own private road? I wonder if I can make the road infront of my house private and collect toll for cars wishing to pass by.